Signatory organizations respond and express our concerns regarding unprecedented large-scale police operations carried out simultaneously at several clubs of Tbilisi at midnight on May 12 and afterward massive and arbitrary detention by the police of members of the spontaneously organized rally in Tbilisi streets, as well as interference with the assembly and the incidents of degrading treatment. As reported, based on the court order of 10 May 2018, the Ministry of Internal Affairs was authorized to search the territories of several clubs of Tbilisi. On May 12, the Ministry of Internal Affairs conducted search operations using large-scale police force late at night when hundreds of people were gathered in the clubs. According to the information available to us, at the beginning of the special operation, in several cases, people were removed from the clubs in degrading conditions, and the owners of the clubs and administration did not have the possibility to properly attend search process. Group of youths removed from the club as well as people dissatisfied with large-scale special operations started to gather spontaneously near Bassiani. The police did not allow the members of the rally to block the road despite their large number, and by means of cordon and aggressive behavior forced them to arrange themselves on pavements, in obviously insufficient spaces. Eventually by episodic and aggressive actions, using disproportionate force against some people and detaining several leaders of the rally, the police managed to isolate the groups of members of the rally, dispersed them in different streets and cleared the territory of the assembly by means of a large-scale cordon. Notably, on the whole, the rally was held in a peaceful and lawful manner and for the most part, arbitrary incidents of escalation and detention were created by the police themselves. 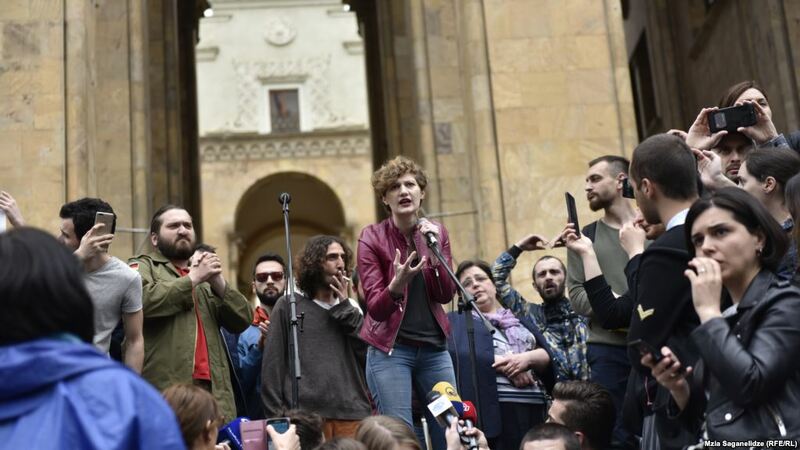 As a result of the actual disassembly of the rally near Bassiani, members of the spontaneous protest moved to the Parliament, where the police tried to demonstrate force again and to create the environment of fear and insecurity, and in some cases, the facts of arbitrary detention of several people were detected. Possible leaders of the spontaneous rally were detained which on the whole, taking into consideration general approaches of the police, referred to the interest of opposing the protest and weakening self-organization. According to the information available to us, as a result of the special operation carried out yesterday night, up to 40 people were administratively detained. Some of them were physically injured at the moment of detention. At the initial stage, finding detained persons’ whereabouts and ensuring lawyers’ timely communication with them was difficult for us. Any type of violence against detainees at the detention facilities or fact of offense has not been detected so far. Signatory organizations are obviously aware of the importance of the fight against the drug trade and the obligations of the state in this regard. This process should start by revealing influential criminal networks and strict reaction towards them. At the same time, substantial change of state policy towards drug users, and instead of inhuman and punishment-oriented policy, activation of care and social rehabilitation oriented approaches is necessary. Unfortunately, the ruling political party suspended announced reform in this regard and left it only to the police repression and criminal sphere. The problem of protecting human rights standards when managing assemblies is an important challenge for the Ministry of Internal Affairs, however, police measures carried out in Tbilisi streets on May 12 was a clear and recently unprecedented case of aggressive demonstration of repressive apparatus by the state. Near the clubs and the Parliament, the police occasionally detained peaceful citizens by means of “micro special operation” and for the most part, such effort of the police was directed towards civic/political activists. According to the information disseminated by the Ministry of Internal Affairs, 8 persons have been arrested within the scope of investigative activities. However, as we were informed later, this arrest has not been carried out as a result of the special operation and they have been arrested earlier in different situation, outside the territory of the clubs. Under this circumstances, questions obviously arise regarding the necessity and justification of special operations carried out in this form and scale. Questions arise regarding the justification of the Court order on search as well, which included the high risks of general, non-individualized search on the club territories and interference with the rights of a wide group of people. The Government should properly understand hard social consequences of the strict policy towards drug users and instead of punishment-oriented approaches, should make the policy social care oriented.Moreover, the Government should ensure respect for human rights during the fight against the drug trade. Signatory organizations express our readiness to provide necessary legal aid to the victims of human rights violations. Moreover, we call on the citizens to share information regarding the cases of human rights violations which will enable us to properly assess the situation and react.